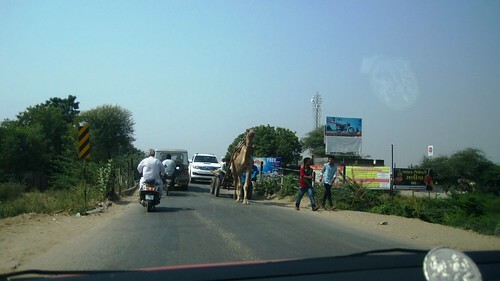 “Oh look, camel on the road! We should have entered Rajasthan”, my mom said excitedly. 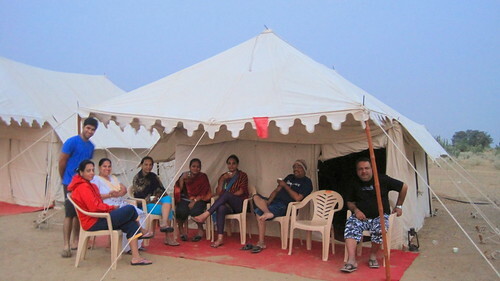 We were on a family trip then on a November morning driving the 550 kms towards Jaisalmer from Ahmedabad. And the fact that my mom hails from Rajasthan answered for her excitement. And the fact that I love driving almost as much as riding has never featured on this blog earlier! So, let’s get down to it? Picture. Dry weather. And dry roads. 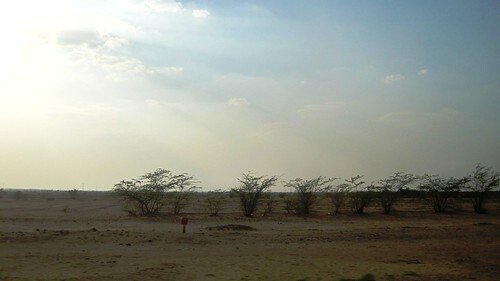 Trees started to go sparse and less tall as we drove from Ahmedabad in Gujarat through Barmer to the golden city, Jaisalmer. Heaps of sand slowly began to accumulate as we drove further into Rajasthan. The windmills followed the mounds of sand. And they were quickly followed up by the very evidence of the gold in Jaisalmer: Sun was on it’s decline and all the mud houses and buildings alike reflected the golden color, thanks to the yellow sand and the sandstone used in their construction. The palaces inside the fort, their architecture and decors was a peek for us into the lavish life of the kings and queens of the bygone era. Different venues within the palace for religious ceremonies, meetings, games, dances, etc gave away a hint of the royal interests and the fact that the big shots were never short of time or space. At the same time, it was a depressing and thoughtful scene that while the King’s Palace still stood untouched, the wall of Queen’s Palace now displayed bedsheets and curtains, tshirts, and turbans, and the likes on sale. Why the wall of only Queen’s Palace and why the Queen’s Palace’s wall only were my questions. We went for camel rides towards the border, saw the Sun setting behind the mountains of sand and then camped in the desert at Sam Sand Dunes. All the families and their too many kids at our camping site sat around the fire taking in the local folk music and dance. It was not long before all of us jumped in too and displayed our marriage-style dance with no shame to speak of. After the oldies retired to their tents, I led the kids’ gang to the adjacent cliff in the dead of the night. So silent were our murmurs and feet (because of the silence all around) that we could have surely passed for a short sized looters’ gang whose name could have been ‘The-Thar-Robbers (Jr.)’ ( 😀 ). It was my first time experience of the desert and it was great doing those somersaults on those sand cliffs! So goes one of the versions of the epic tale of the values and morals of the folks of Kuldhaara: “The King eyed a Brahmin girl from the village of Kuldhaara. It was against the values of the Brahmins to give their daughter to a family which consumes meat and alcohol. 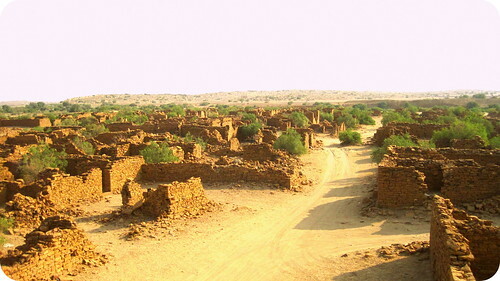 Because it was clear that abusing the will of the King would not be a good idea either, villagers of Kuldhaara and the neighboring 86 villages vacated their homes overnight.” One can see the ruins of those huts and villages today. But as I said, “so goes one of the versions”. 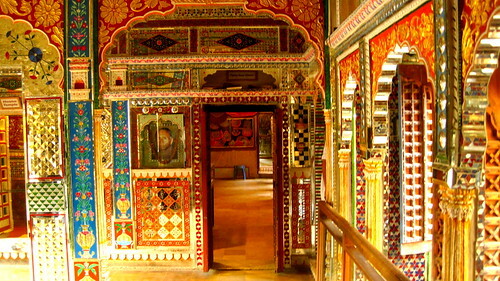 Patwon ki Haveli, Salim Ji ki Haveli, etc. 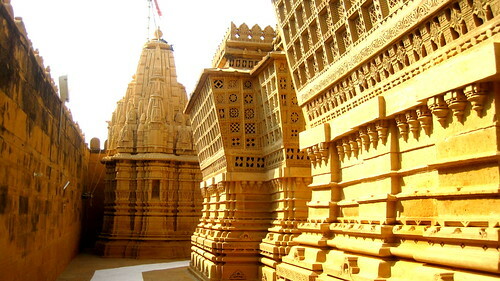 are suggested as must visit attractions in Jaisalmer. It was interesting to see a part of these havelis being occupied by the descendants while another part being available for public display (on charge, of course). Offering a wonderful site to catch the Sunset and the windmills, Vyas Chhatri is a centopah dedicated to Sage Vyas, author of the epic Mahabharata. It was an evidence of the remarkable local architecture. While returning from Sam Dunes, we spotted a whirlwind in the desert. While it was going away from us and was not too intense, but its speed did scare us for a while. Jain temples have always fascinated me with their architecture, finishing and detailing of their designs, and Jain temple in Lodhruva was no less in holding us all in wonder and amazement! 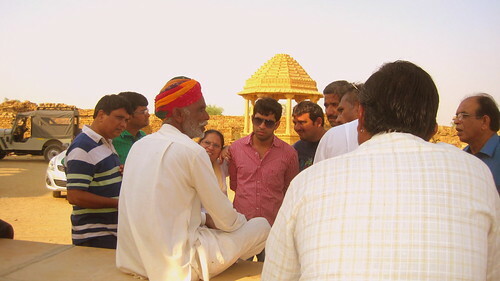 The commercialization of Jaisalmer had faded the Rajasthani local touch, we all could observe. 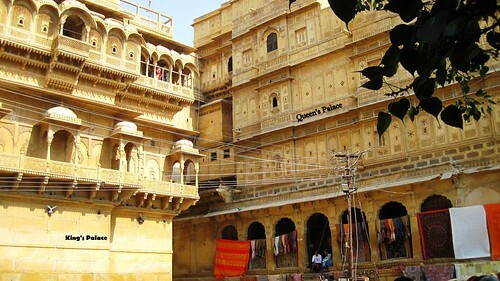 Yet, once you step out of the Jaisalmer city or the Fort area, the local music begins to fill your ears and the aroma of local food starts playing with your mind. At the same time, the arid lifestyle and the problems which accompany it can also not be over sighted. 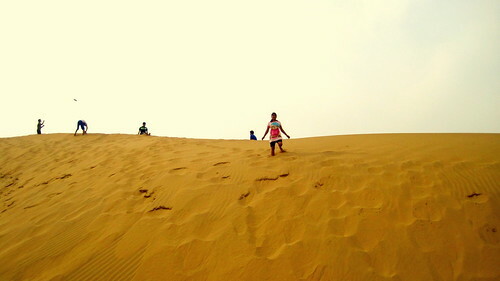 In all, Jaisalmer trip made for a lot of family fun and a good Rajasthani experience. Bargain, Bargain, Bargain! 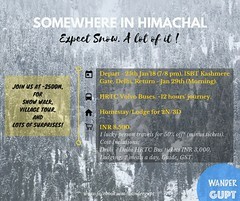 : There is a lot of scope of bargaining whether for the camel rides, tourist camping packages, or while shopping. For the camel rides on Sam Sand dunes, you can directly drive down there and opt for the camel rides from their owners rather than booking through the agents in the city. Be watchful of the pickpockets in the fort, and at the Dunes. Many a times, beggars would come to you, and dance in front of you whether you want it or not, and then ask for the fees for the same! If you like the post, consider hitting a like on my FB Page! Lovely post Jatin. The interiors of the palaces and havelis are so colourful in sharp contrast with the deserts and roads. 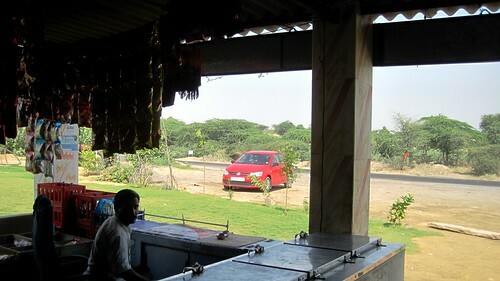 I have been up to Udaipur by road, and the journey is pretty enjoyable. Bet it is. You must go. Excellent. You have reminded me of my trip to the beautiful place. hahaha those camel rides, somesaults And the fun we had. Bhai, I went into flashback of good old days. Amazing deserts… this has been evading me for a long time… this year I will! Thoroughly enjoyed reading your post. Felt like I went there again..roaming inside the fort. 🙂 Love the architecture shots. Absolutely… 🙂 Jaisalmer fort has a quaint charm that is irresistible. 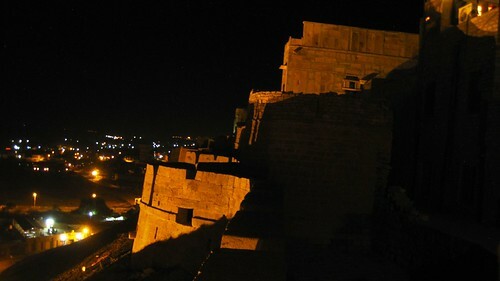 Rajasthan is a very good place to visit the Old Ancient Fort that are really awesome. 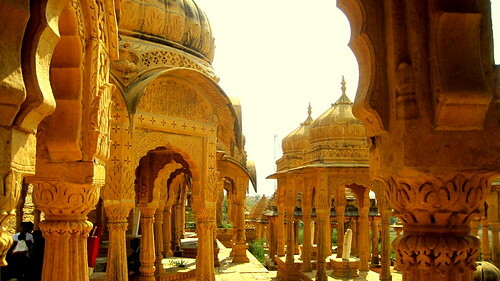 In Rajasthan you can feel the Real Architecture of Rajasthan Forts and Royal Palaces. you can here visit Forts, Museums, Lakes and Desert. 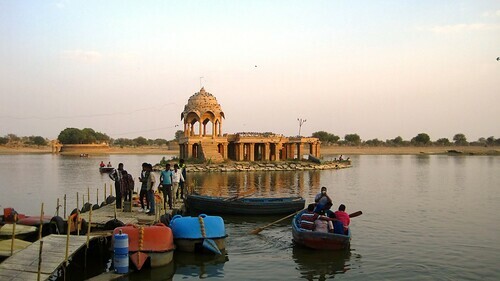 Rajasthan Tourism Packages are the best tour packages to Visit and Experience the Real Culture of Rajasthan.